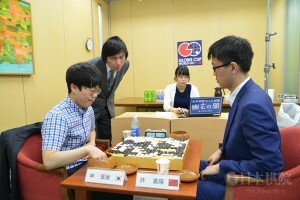 Kisei S League starts: The S League of the 43rd Kisei tournament got off to a start on April 19, with all six members in action. This is a small league, so it’s important not to stumble at the beginning. (April 19) Yamashita Keigo 9P (W) beat Cho U 9P by resig. ; Kyo Kagen (Xu Jiayuan) 7P (B) beat Takao Shinji 9P by resig. ; Kono Rin 9P (B) beat Ichiriki Ryo 8P by resig. (May 10) Kyo (B) beat Cho U by resig. ; Yamashita (B) beat Kono by resig. (May 24) Takao (W) beat Ichiriki by resig. The last game above completed the second round. Yamashita and Kyo have made good starts with two wins each, but the previous challenger, Ichiriki, has got off to a disastrous start with two losses. 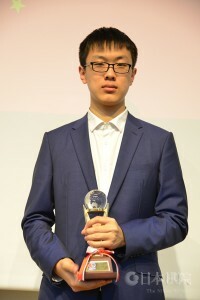 Xu of China wins Globis Cup: The 5th Globis Cup was held on the Tokyo campus of the Globis Management Graduate School from April 20 to 22. In the final (left), the 18-year-old Xu Jiayang 6P (right) of China beat the 19-year-old Shin Minjun 7P of Korea. Playing white, Xu won by 1.5 points. He earned a prize of 3,000,000 yen (about $27,700). The best results for the host country were the quarterfinal places earned by Fujisawa Rina 3P and Yo Chito 4P. Fujisawa picked up a win over Xie Ke 5P of China; taking black, she won by resignation. The 18-year-old Xie is a formidable player, having recently challenged (though unsuccessfully) for the Chinese Tianyuan title and having reached the best eight in the Chunlan Cup, so Fujisawa had reason to be pleased with her win. Actually this was her 50thwin as a 3-dan, so it earned her promotion to 4-dan. In the quarterfinals, she was eliminated by Shin Jinseo 8-dan, winner of the previous Globis Cup. Yo keeps Honinbo seat: The second play-off to decide who would be the fourth player to retain his seat in the Honinbo League for the upcoming 74thterm was held on April 23. Taking white, Yo Seiki 7P beat Ida Atsushi by 1.5 points. This was Yo’s fourth Honinbo league but the first time he kept his place. Ida had started off with four straight wins and looked a good bet to become the challenger, but, including his two play-off games, he then lost five in a row. This is not often mentioned, but membership of a league will earn you enough in game fees, win or lose, to secure your livelihood for the year, so league seats are very valuable. Shibano wins Japan-China Ryusei: The 4th Japan-China Ryusei play-off was held in Beijing on April 29. Shibano Toramaru 7P (Japan) (W) beat Ke Jie 9P (China), at present the world’s number two, by resig. This is Japan’s first win in this play-off. Although the 18-year old Shibano is a rising star in Japan, probably not many fans expected him to win this game. It’s undoubtedly the biggest win of his career so far. Shibano’s results in April had not been very good. He commented: “I was not expecting much from this game. That may, on the contrary, have been good, as I was relaxed.” First prize was 3,000,000 yen (about $27,500).